The standardized guidelines of our Deliberate Training Strategies are implemented into our training process and will cultivate the sustainable development of our students. This standardized approach will guide the student to progressively improve their technical and tactical skills within a training environment that places primary value on the safe and gradual growth towards mastering in-game ARC3 Performance. Each student will be guided from our four standardized Deliberate Training Strategies and will receive the positive and constructive feedback necessary to achieve cumulative improvement for sustainable development. The Training Profile standards, categorize the development levels and define the characteristics that will determine the training programs best suited to the student’s level of development. 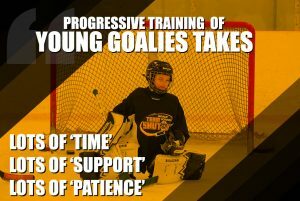 Advance Level – students who demonstrate competent mechanics in the technical execution of ‘goalie specific’ skills and can be challenged to execute with the Body and Edge control necessary to transition in the crease with the ‘prime goalie’ physical qualities of Stability, Acceleration and Agility. Elite Level – students who demonstrate proficient mechanics with strong physical qualities and can be challenged with high tempo tactical drills. The Training Phase standards, categorize the development stages and define the training focus best suited for the student’s stage of development; and also takes into consideration their chronological age, physical development and history of training experience. Proficient Stage– Continue to improve acceleration while challenging the ability to process information in order to tactically execute during reaction focused drills. The Training Speed standards, identify the appropriate training method according to the student’s specific skill improvement needs during a drill and provides the required modification and tempo adjustment in order to safely and progressively develop the skill training purpose within the drill. Isolate Method – An ‘Isolate’ Training speed approach slows down the skill execution to target the development of one ore more execution keys. This will encourage the Fundamental Level students to apply the mental engagement necessary when training with conscious focus. Dynamic Method – A ‘Dynamic’ training method encourages the student to bridge the technical skills and tactical situations, with body and edge control, while transitioning through the drill with strength and efficiency. Reaction Method – A ‘Reaction’ training method challenges the student to improve Composure Command and Compete with the use of game simulated drills to develop the vision skills needed to Read, Process and Execute with consistency. 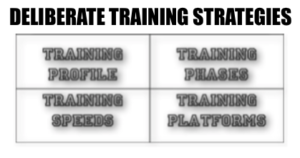 The Training Platforms standards, identify the training formats that can be best applied to the students development. The programs within each format is complete with a training syllabus and lesson plans that can best develop the student, according to their profile and improvement needs. Skills & Drills Clinics – The platform will provide Fundamental and Advance programs that will guide and encourage the student through the specific skills repetition during level appropriate drills in a WEEKLY lesson plan. Performance Clinics – The platform will provide Elite programs that will challenge the student with high level shooters in a high tempo drill environment with the objective of building the ability to read, process and execute with effective and timely transitional explosiveness. 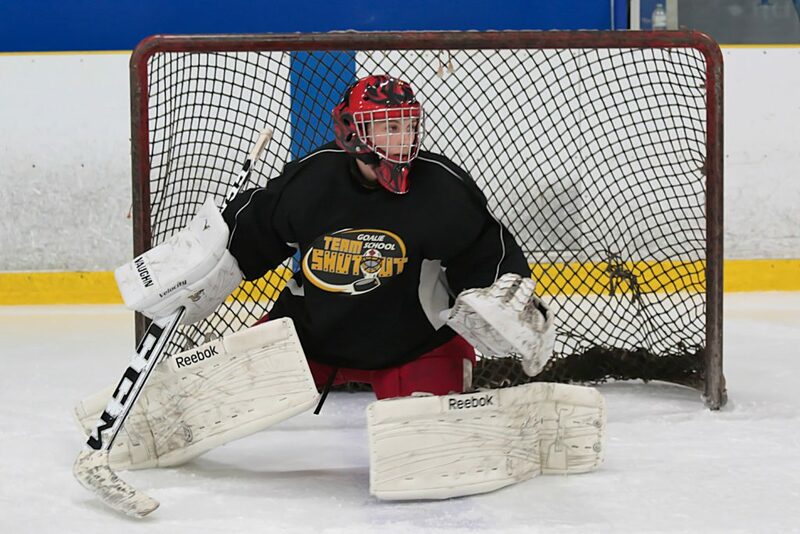 PowerSkating & PuckHandling Clinics & Workshops – The platform will provide Clinics and Workshops specifically designed to focus on a goalie’s Skating and Stick skills. Pre Tryout Clinics – The platform will provide Open and Elite formats in preparation for the team tryout selection process. Development Camps – The platform will provide Fundamental and Advance programs that will guide and encourage the student through the specific skills repetition during level appropriate drills in a FULL DAY lesson plan. Performance PLUS Coaching – The platform will provide a variety of programs that will incorporate Training + Performance COACHING and help improve in-game execution. Private Training – The platform will provide private sessions based on the development needs demonstrated by the student in the specific areas of Technical and Tactical skills. Team Practices – The platform will provide training during team practices based on the development needs demonstrated by the student in the specific areas of Technical and Tactical skills. Our Profile Based Development Philosophy will cultivate the student’s confidence by progressing the training to meet their age and stage of development.